Darkest animated Batman. Engaging but disjointed and lengthy prologue make the movie good, but uneven. 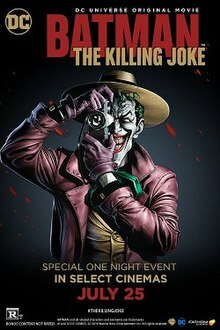 I can not fathom why TPTB, would tackle The Killing Joke, even for a quick buck. It is a wind sprint into the darkest recesses of the DCEU. And the choicest morsels would never make it into the finished film. Like Carol in The Walking Dead.....Insane or Ahead of the Curve? The Philosophy of The Joker: Insane or Ahead of the Curve?